Larkin Poe have announced details of their new album ‘Venom & Faith’, to be released November 9, 2018. The Nashville-based sister duo have also announced a headline European tour in support of the new album, starting in London at Islington Assembly Hall on November 21 and taking in dates in Germany, Austria, Italy and Spain. The European dates will follow Larkin Poe’s featured guest performer spot on Keith Urban’s Graffiti U Tour across North America this autumn. The follow-up to their critically acclaimed second album ‘Peach’, which was nominated for a Blues Music Award for Best Emerging Artist Album, ‘Venom & Faith’ was produced by the band and their long-time engineer Roger Alan Nichols. In a genre as storied as American roots and soul, Larkin Poe – aka Atlanta, Georgia-born sisters Rebecca and Megan Lovell – make a mark all their own with ‘Venom & Faith’. Rather than concede to the history of the canon they hold dear or rest on their laurels, Larkin Poe persist and emerge rattling, stomping, and sliding into a modern-day depiction of what roots rock should sound like… another chapter in an everlasting story. “It’s a celebration of American roots music as translated by two sisters who are playing the blues in a modern age,” says Rebecca about their new album. Descendants of celebrated US writer Edgar Allen Poe, since forming Larkin Poe in 2010, Rebecca and Megan have proven a formidable duo both in and out of the studio. In 2014, producer T-Bone Burnett enlisted them for ‘Lost On The River: The New Basement Tapes’, a project that also saw contributions from Marcus Mumford (Mumford & Sons) Elvis Costello, Jim James (My Morning Jacket), Taylor Goldsmith (Dawes), and Rhiannon Giddens. The sisters have performed at Glastonbury Festival twice, and were named ‘Best Discovery Of Glastonbury’ in 2014 by The Observer. They have opened for and been in the backing band of Elvis Costello and Conor Oberst; and supported the likes of Gary Clark Jr. Rebecca and Megan were also members of the all-star backing band for the 2017 MusiCares Person Of The Year tribute honouring Tom Petty (also organised by Burnett) alongside Jakob Dylan, Jackson Browne, Elle King, Lucinda Williams,Gary Clark Jr., Don Henley, and Randy Newman. 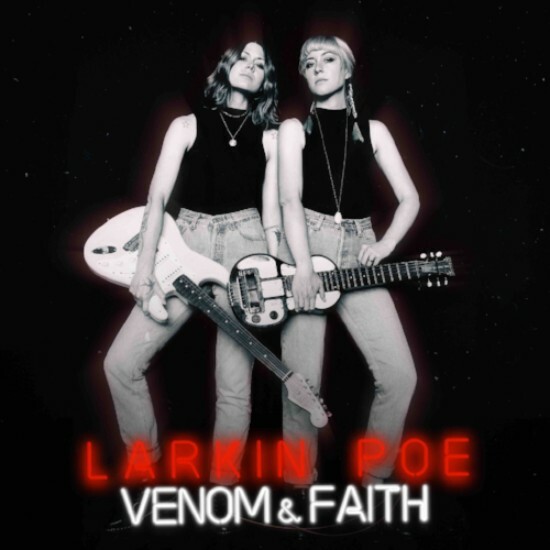 Recorded in Nashville earlier this year in between headline shows, festival dates such as Bonnaroo and Lollapalooza, Larkin Poe approached ‘Venom & Faith’ with fierce independence. From Rebecca’s powerful vocals on “Ain’t Gonna Cry” to Megan’s sultry lap steel on “Good And Gone,” the sisters weave their talents into the fabric of their experience and a picture of the American South. “Blue Ridge Mountains” harkens to the sisters’ hometown, “drinking sweet tea every day” with stomping percussion and churning riffs. Still, the sisters maintain an outlaw mindset in a traditional genre. Unbound by tawdry embellishments, Larkin Poe infuse pop sensibilities into their sound, blending old-school elements of rock and soul with drum samples, hip-hop production values, and resonant lyrics like “California king-sized dreams in a twin bed.” ‘Venom & Faith’ redefines what it means to make emotionally resonant music while also maintaining boundary-pushing musicality. Save for two covers (“Sometimes” by blues legend Bessie Jones and Skip James’ “Hard Time Killing Floor Blues”), the rest of the record’s tracks are Larkin Poe originals. Paired with unique production touches like organic percussion sounds — the thumping of dresser drawers, the slamming of back doors, and stomping on hardwood floors — ‘Venom & Faith’ bleeds Lovell. The sisters once again perform all instruments on the album except on “Mississippi” which enlists the slide stylings of friend and seasoned guitar legend Tyler Bryant.